Butch Hobson, a former major-league player and manager, made a dramatic exit after being ejected from an independent-league game in Fargo, N.D. Ever hear of a manager getting credited with a caught stealing? Chicago Dogs skipper Butch Hobson got so incensed after he was ejected from an independent-league game in Fargo, N.D., that he yanked out third base and handed it to a kid in the stands as he exited the field. Somewhere, Oscar the Grouch is smiling. 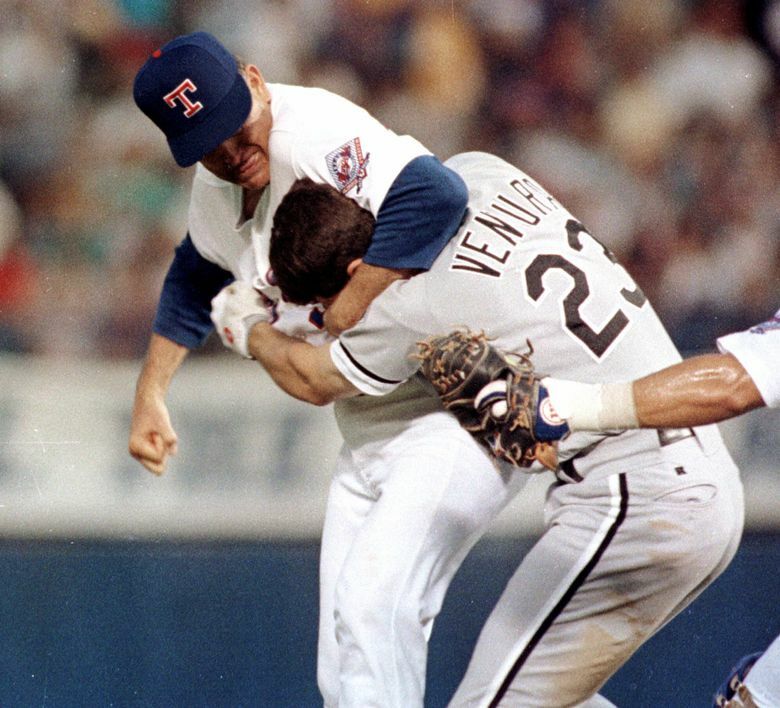 Aug. 4 marked the 25th anniversary of White Sox hitter Robin Ventura charging the mound and taking a pummeling after Rangers pitcher Nolan Ryan put him in a headlock and delivered a series of quick punches upside the noggin. It’s believed to be the only bobblehead night in baseball history in which no dolls were given away. Smithfield Foods has been ordered to pay $470 million to neighbors for the smell from a hog farm. Don’t go getting any ideas there, Oriole fans! Antonio Callaway turned a short pass into a 54-yard TD in the Browns’ exhibition opener, just days after the rookie receiver was pulled over and cited for marijuana possession. Just one question: If the cops can catch him, why can’t the New York Giants? The European PGA Tour shanked an electronic deposit of the $154,000 that English golfer Tommy Fleetwood won at the British Open, putting it into the bank account of Tommy Fleetwood the Orlando-area golfing pro instead. Wednesday’s Yankees-White Sox game was held up to extricate a giant bug that flew into the ear of second-base umpire Bruce Dreckman. Let’s see him try yelling “infield fly” with a straight face again. Giants receiver Odell Beckham Jr. had diamonds shaped as a cross implanted onto one of his teeth, TMZ reported. In keeping with the theme, Beckham requested they make it a two-minute drill. Massachusetts, with 21 percent of residents saying they smoke marijuana, is the nation’s No. 1 state for pot use, according to a new report. It was 15 percent until the Patriots lost in the Super Bowl. North Carolina suspended 13 football players for 1-4 games after they got caught selling their school-issued, special-edition Nike Jordan shoes. The PGA of America’s computer servers were compromised before the PGA Championship, keeping officials from accessing files. One of the first orders of business when they do get back in: Expand the definition for “hacker” in golf lexicon. Or as Nate Newton might call it, a slider. Party Dancer — a filly owned by ex-Louisville basketball coach Rick Pitino, whose legacy was tainted by revelations of exotic dancers being hired by an assistant coach to woo recruits — just won Thursday’s fifth race at Del Mar Racetrack. Bettors’ winnings, we assume, were paid out in $1 bills. Two pairs of minor-league teammates — Gio Brusa and Jalen Miller for the Class A San Jose Giants and Kevin Newman and Jacob Stallings of the AAA Indianapolis Indians — have hit for the cycle in the same game this season. Such a two-fer has never been done in the major leagues.